Note that the horizontal axis is plotted at a ratio value of 1, so an excess of heat records is above the axis, and a deficit is below. 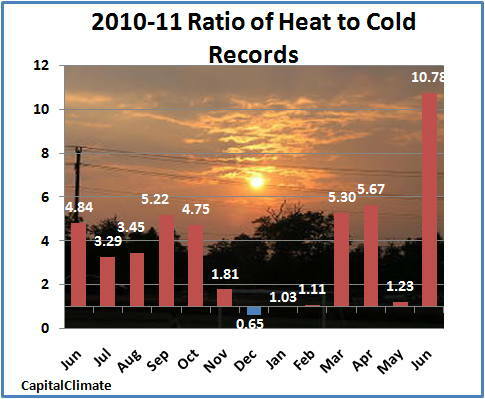 There was only 1 month (December) in the last year-plus with a deficit of heat records. Following through on the momentum set in the first 9 days of June, the first month of meteorological summer has concluded with U.S. daily high temperature records outnumbering low records by an incredible ratio of 10.8 to 1. 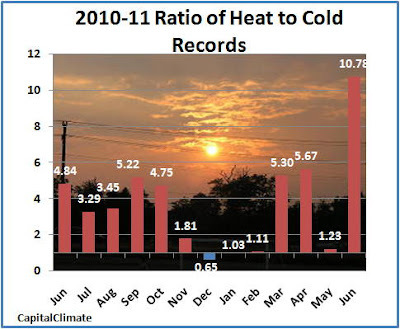 This brings the ratio for the first half of 2011 up to 2.4 to 1. In addition to the 2706 daily high temperature records, 63 all-time June temperature records and 17 all-time (any month) records were set. One all-time monthly record has already been set so far in July (Willow Run Airport, Michigan). Note that Amarillo, Borger, and Dalhart each had the distinction of setting new records and then surpassing them a second time in the same month. Each of the new records is an amazing 3° above the record previous to 2011. Tallahassee broke the record by 2° after tying it earlier in the month. Several June monthly records were exceeded by multiple degrees, including Tulsa OK, where 106.0° on the 27th broke a record of 103.0° set in 1953. 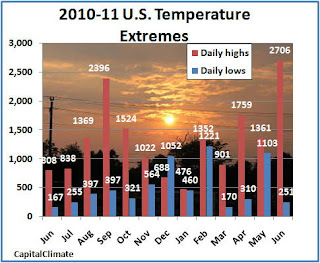 Monthly total number of daily high temperature and low temperature records set in the U.S. for June 2010 through June 2011, data from NOAA National Climatic Data Center, background image © Kevin Ambrose (www.weatherbook.com). Includes historical daily observations archived in NCDC's Cooperative Summary of the Day data set and preliminary reports from Cooperative Observers and First Order National Weather Service stations. All stations have a Period of Record of at least 30 years.